Susie I love the curving of your Physostegia virginiana….mine don’t generally curve at the tips but I love the artsy look they make. 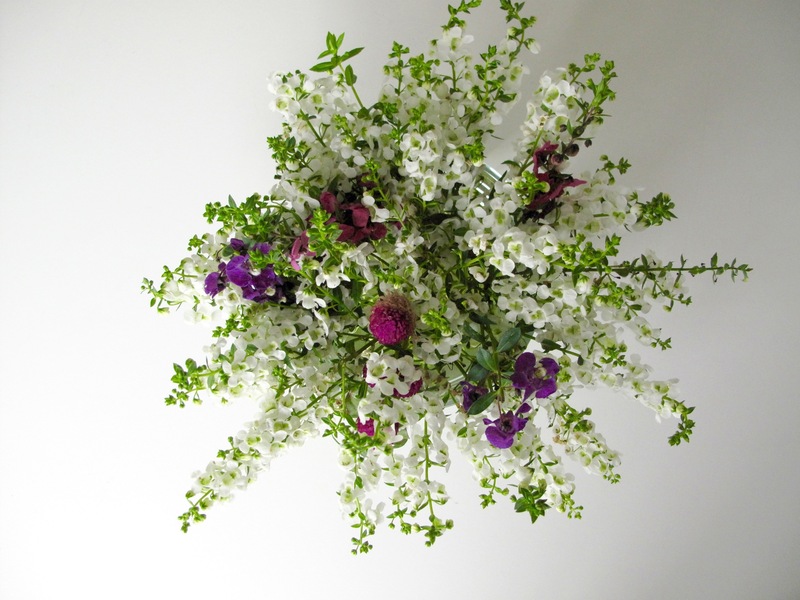 And the white Angelonia is lovely with the purples and pinks…..stunning from above. Sounds like you had quite a lovely party…. Thanks Donna. The Physostegia seem more interesting to me this year than ever before. The party was wonderful–special get-togethers like that mean a lot. Yes, great time yesterday. Thanks Bec. Physostegia has me charmed this year. It’s driving quite versatile in arrangements. 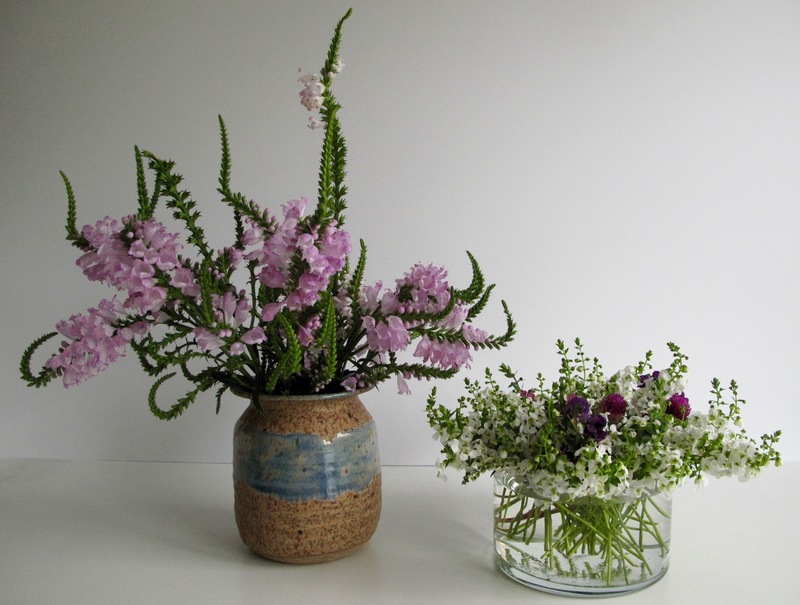 Two very beautiful arrangements. Well done. I’m sure you must have had a wonderful time with your daughter and family, it is always hard to live so far apart. I know you are a perfect hostess so all the guests must have had a great time. Adding so many flowers around the house really makes it feel like a very special occasion. 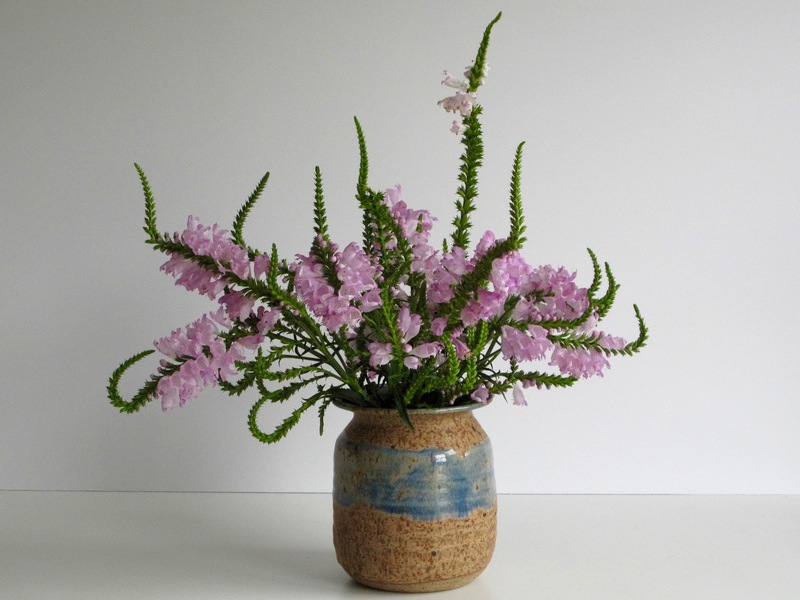 I admire Physostegia virginiana in your vases and in others I’ve seen recently; is it really a native of Virginia? It seems to have coped well with the heat so perhaps I should try it. The second vase is lovely combination of textures too. Thanks, you’re so sweet. We are having such a good time and it will be hard to say goodbye. Yes, the “virginiana” in Physostegia virginiana does refer to the state of Virginia, but the plant is native to large parts of North America. I received this as a pass-along plant. It requires no care at all, but it does tend to flop and would benefit by staking (which I don’t bother with). How lovely to have a gathering like this – and even more of an excuse for lots of vases scattered around. The ones you have featured are delightful in their simple elegance – and like other commenters I am going to seek out whether they can be successfully grown here. Is the amaranth related to the amaranthus with the long ‘lamb’s tail’ flowers? Thanks Cathy. All of the vases were simply arranged, but collectively made the house look festive. Gomphrena globosa and Amaranthus caudatus are from the same family: Amaranthaceae. Both are annuals and make nice dried flowers. Lovely to celebrate a family get- together with flowers from your garden. The Physostegia is lovely and makes wonderful shapes. 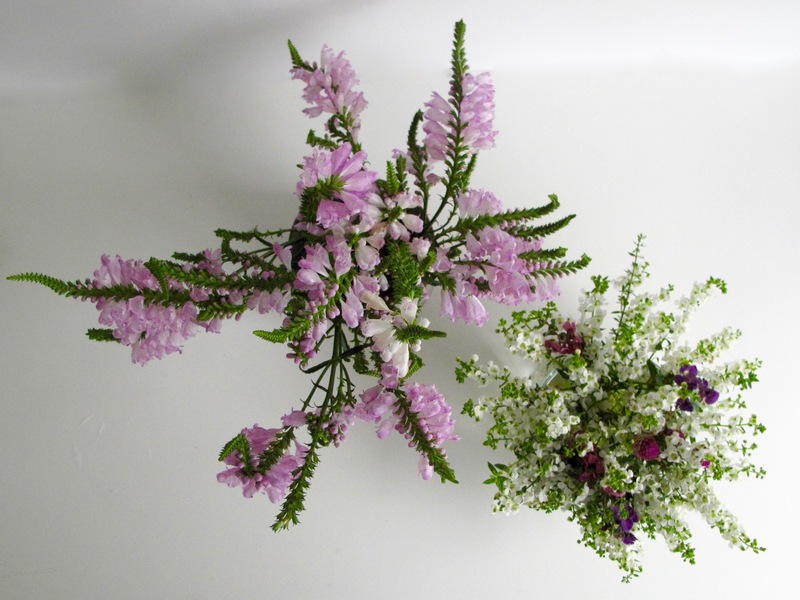 And that pretty little Angelonia which I admired before, is delightful with the Gomphrena. I don’t always get the dusting done, but I do try to pluck some flowers when people are coming over. Angelonia has become my favorite annual. Fun family celebration and beautiful flowers make for a good time. 🙂 Both vases are beautiful but I’m partial to the white one with the pop of color. Thanks Judy, that’s my favorite vase too. Wish you could see it in person. The photo doesn’t do it justice but those dark purples and reds are just scrumptious. Love the interesting shapes and colors, the vase selection is perfect. Thanks so much. I’ve never noticed obedient plant much before, but it has an interesting structure, a little abstract. I use almost every vase in the house! Nice! I like the simple arrangements the best. Angelonia is a winner all the way around in my book. Today I saw a hummingbird nectaring on mine for the first time, so I know they like them. My sun garden (where the Angelonias are) is on the side of the house where I can’t see it from the inside. Next year, I’ll plant some Angelonia where I can see them out my window. 😉 Lovely vases and photos, as always! Thanks Beth. I’m excited you’ve seen Angelonia being visited by hummingbirds. I’ve been a little unsure how attractive it is to pollinators. I’ve tried planting Angelonia in several locations around the house and it definitely loves the sun. Do you buy plants (which is what I do) or plant seeds (which I’m starting to see more readily available now)? I find your Obedient bouquet amusing, in the very best way. Setting the stage with flowers is one of the best ways to assure a successful party. Thanks Rickii! I so agree with you. 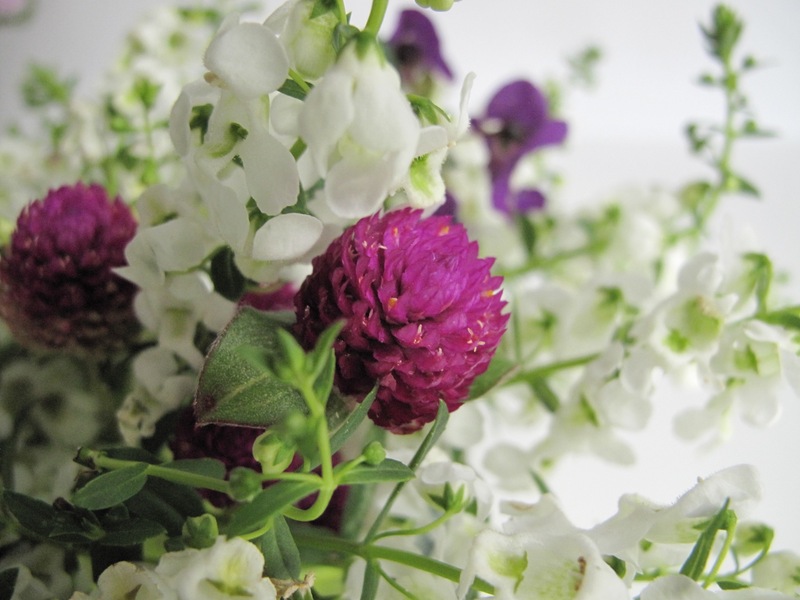 The phytostegia looks like a sea anemone. I love it! Oh sea anemones are fascinating! Thanks Melissa. It’s wonderful to have fresh flowers in the house. Love the Physostegia – never seen it curl like that. Not sure I have either, but have noticed it has a strong “instinct” to grow upright. So even when the wind knocks the stems over the flowers are always reaching to right themselves.